In the first part of this series, I covered the modern patterns I picked up recently in anticipation of the post-preggo return of my waist. In part two: a look at my recent vintage stashing and destashing. 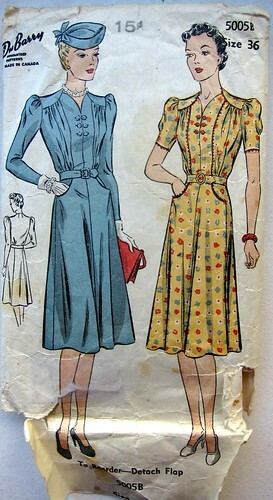 I'd definitely go knee-length in a lightweight cotton, and I'm not sure I'd do the swirly lace treatment. 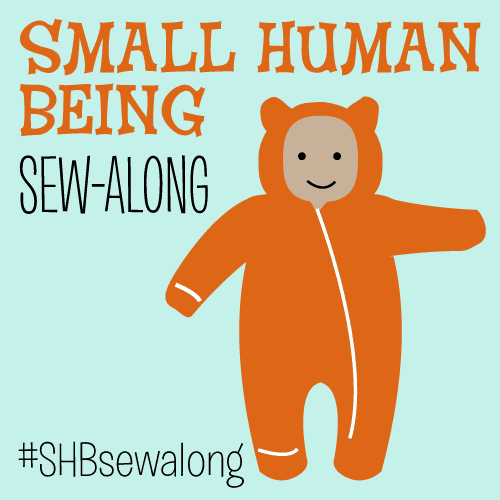 But I don't know that I'll get to it anytime soon, as it's hardly nursing-friendly. 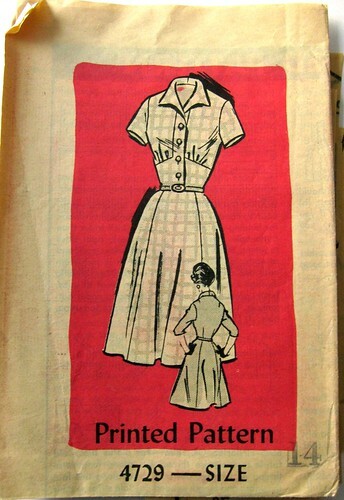 From 1945, a crisp, practical shirtwaist day dress with nice big pockets and a center front pleat. I'm loving the striped cap-sleeve look. 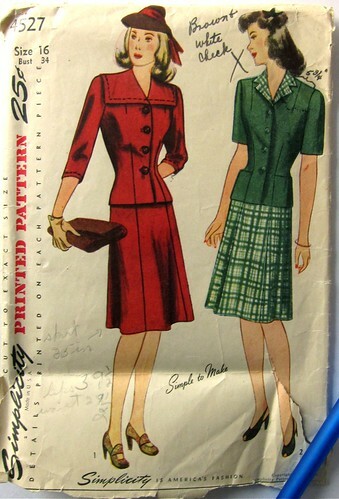 The handwritten penciled note reads "very good skirt pattern for me." Me too! The below ruffled sweetheart neckline housedress is actually a "maternity dress or pinafore", and is super adjustable thanks to the back tie belt. 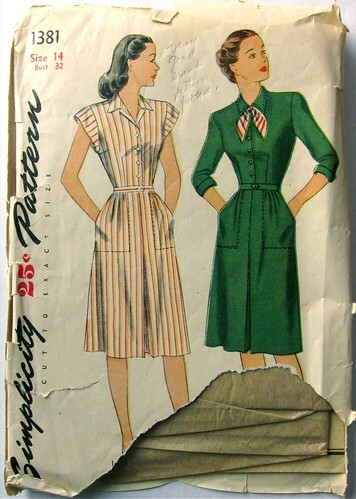 It reminds me of Gertie's recent ode to housedresses (and this 40s housedress in particular). 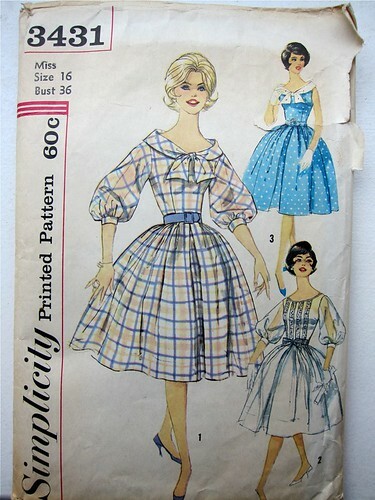 I'd lower the neckline and go for the tinier ruffle treatment. And I have no idea why her eyes are closed. 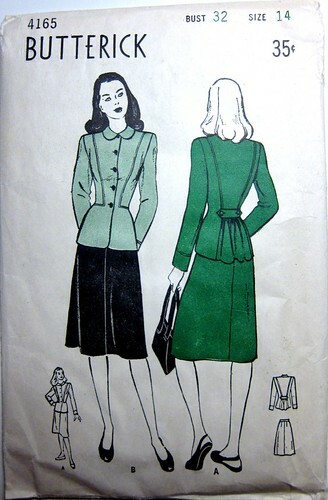 This 1941 button-front makes me wish I was a hat and gloves girl. It's begging to be made up in polka-dot rayon... "The button fronts are top-stitched to the side fronts for a smartly tailored effect." For sure! 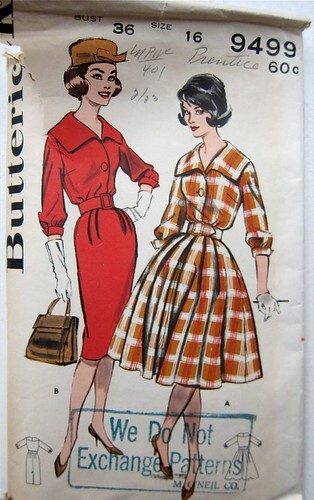 Oh goodness I love a shirtwaist--and with a gathered bust over a fitted midriff, too! 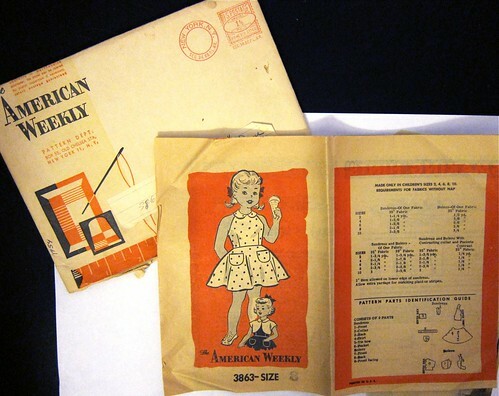 I mentioned this one in a recent post, but I'll show it off again because I love it SO much (and thanks to Sarah, I've learned it's officially from 1940). 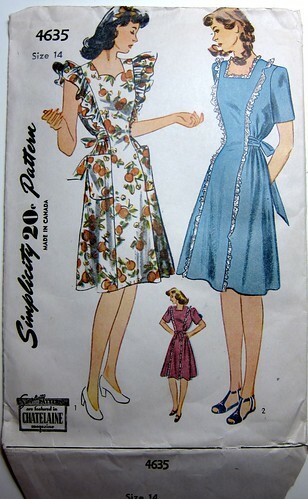 In case you hadn't noticed, the "vertical seaming in the front of the frock lends slenderizing flattery to this design." 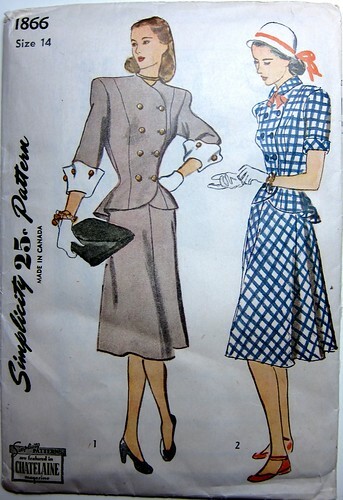 Here's a "Simple to Make" two-piece dress from 1943, with more hand-written notes ("brown + white check"--no thanks!). I wonder if I could make this work for the office? So that's some of what's staying around. Since I have a 36" high bust, I'll have to grade some of these a few sizes (I hear that even if you lose all your pregnancy weight it takes up to 9 months for your ribcage and hips to realign). But that's a skill I've been meaning to learn anyway, and I'll have some help from the latest addition to my sewing library, Grading Techniques for Fashion Design. The book explains manual pattern grading in detail, and has incredibly detailed, illustrated step-by-step directions for accurately grading dozens of styles of bodices, skirts, sleeves, dresses, pants, shirts, etc. by one or many sizes; the 1974 edition can be had used for about $10. 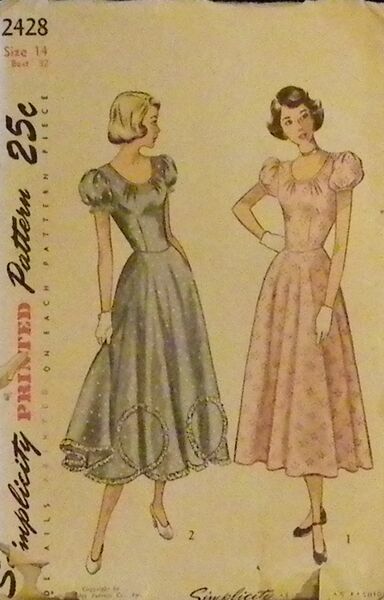 By the way, speaking of the Vintage Sewing Patterns Wiki--I do try, whenever I acquire a vintage pattern--whether or not I plan to keep it--to check to see if it's in the Wiki. And if not, I add it--you can see my contributions here. Oh, those are great fun! How many were there all together in your fuzzy-photo find? 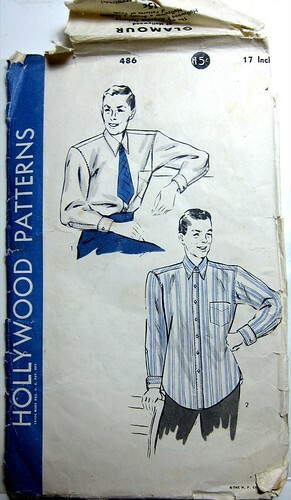 Peter, I got three boxes total--one had 13 patterns, one had 23 patterns, one had 45 patterns. The boxes cost between $8-$15 each, plus shipping. 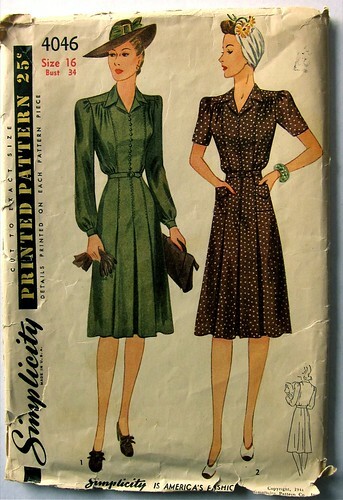 Out of those 81 patterns, 22 were keepers for me... and I'd say about 30 were duds, and another 29 were fabulous but not my style or anywhere near size. But those cuffs on 1866 -- how can you give them up? Okay, I don't think I'd ever wear it either but...I'd have to keep it. And yes, you have got to keep that sundress, even if you won't need it for years. Amazing score! Sarah, I know--I'm totally dithering on 1866. If only it weren't double-breasted... But I KNOW I'd never make it! And that girl's sundress totally looks like the one you just posted about for your daughter, very similar silhouette! I agree, the men in that illustration are frightening! I think it's something about the shoulders -- they are MUCH too frightening! I'm a big lover of the Wiki, too -- so glad you put your finds in there. It's such a great resource. 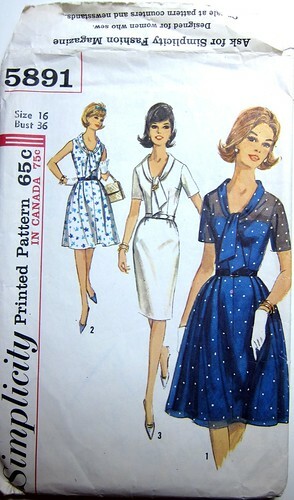 Oh, I love that Simplicity 3431! I have to tell you, my ribcage and torso didn't go back to "normal" (whatever that means) for over a year after nursing. By then I was preggo again, and after the second baby it never did go back to what it used to be. I swear to you, I grew an inch in my torso from having babies. I have no idea why. I've got a copy of 1866, but in a wee size. I graded it up and made it a few years back to wear to a friend's wedding. I used black wool gabardine, with red wool for the cuffs, and silver dome buttons. For silliness'sake, I used a zebra-print silk to line the jacket, since I'd found it as a remnant for a good price. Such fabulous patterns! 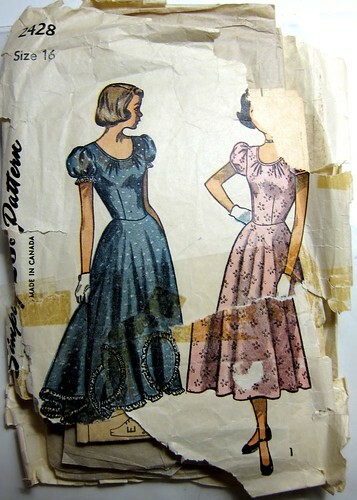 I've acquired vintage patterns pretty much by osmosis (people give them to me), but I am thinking I might have to start seeking some out!